Slow down and immerse your senses in our luxurious chocolate experience. 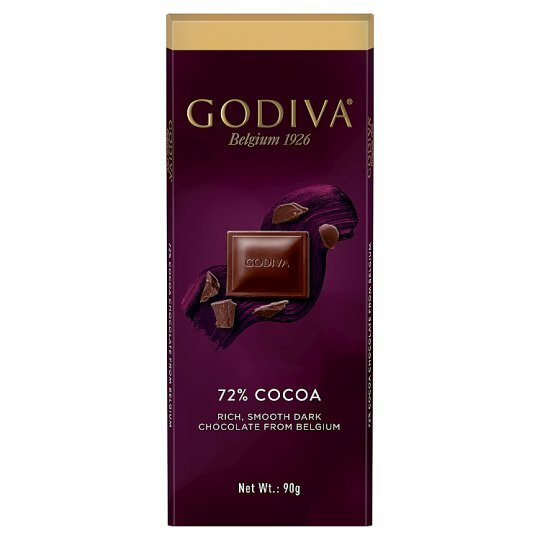 Godiva have been masters in the art of chocolate making since 1926. Our deliciously rich, smooth chocolate is exceptionally crafted with passion and artistic flair, to unlock a rich sympathy of flavour notes. Discover the flavour journey inside each pack. Rich and flavoursome 72% Dark Chocolate: Deliciously rich yet smooth and indulgent dark chocolate. Intense cocoa notes, balanced by mellow creaminess finish. Godiva have been masters in the art of Belgian chocolate making since 1926. Our deliciously rich, smooth chocolate is exceptionally crafted with passion and flair by our Chocolatiers, using only the finest ingredients, to delight and indulge the senses.